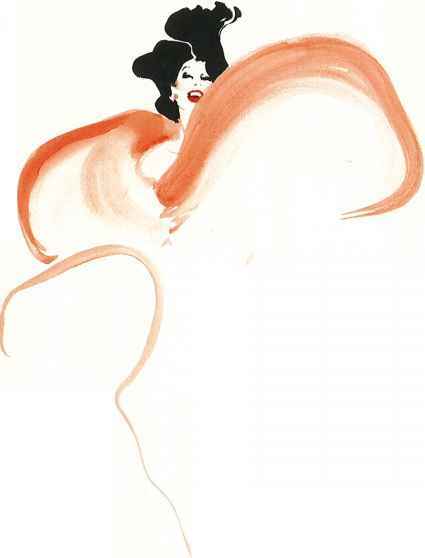 René Gruau, Original illustration, Capeline Yves Saint Laurent for Madame Figaro, 1986. Ink and watercolour. Courtesy Galerie Bartsch & Chariau, Munich. The trend for glamorous dressing-up during the 1980s invested accessories, especially hats, with a new importance. Saint Laurent frames the head with a black halo. 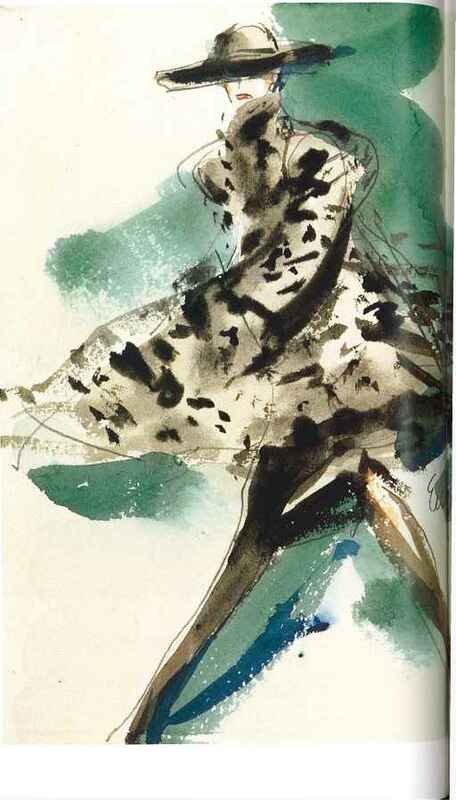 René Gruau, Original illustration of Christian Lacroix for cover of Madame Figaro, 1990. Ink and watercolour. Courtesy Galerie Bartsch & Chariau, Munich. With only a few brushstrokes, Gruau's energy and verve still shine through. Lacroix launched his first Paris collection in 1987 and is known for his use of elaborate surface decoration, combining colour and pattern, although Gruau chooses not to depict this. François Berthoud, Original illustration for cover of Vanity, 1987. Coloured linocut. Courtesy The Zahm Collection, Germany. Berthoud was a major contributor to Vanity magazine, illustrating many of the covers, including this humorous take on Gaultier's pointed bra. 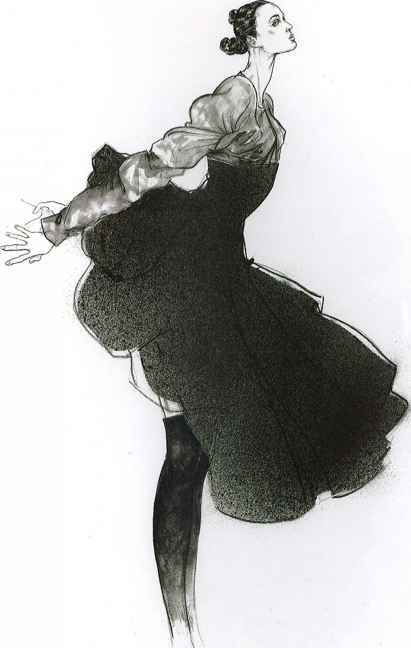 François Berthoud, Original illustration of Jean-Paul Gaultier for Vanity, 1987. Coloured linocut. Courtesy The Zahm Collection, Germany. Gaultier derives much of the inspiration for his work from subcultural fashion, particularly the London club scene of the 1980s. He continues to push the boundaries of couture, exploring concepts of gender and sexual ambiguity, which he combines with classic tailoring and relatively inexpensive fabrics such as denim, rubber and nylon. 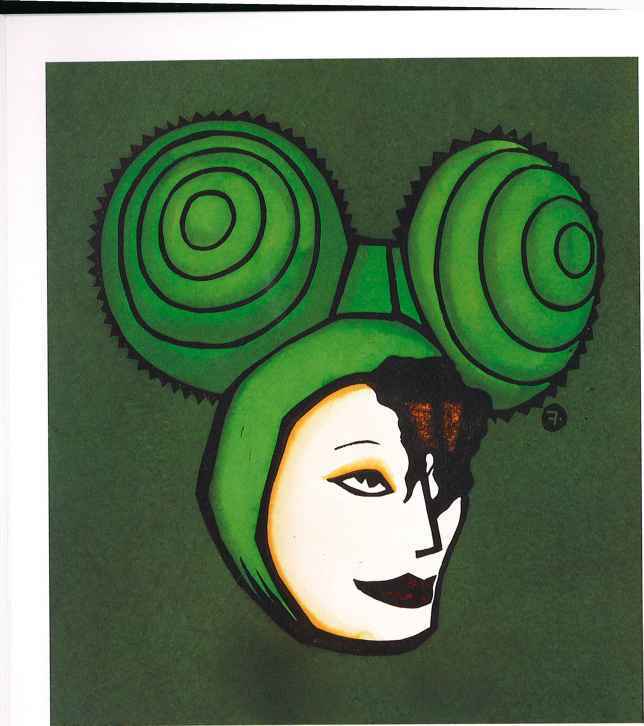 Joe Eula, Original illustration of Mondi for W USA, 1987. Watercolour. Courtesy The Zahm Collection, Germany. A German fashion brand launched in 1967, Mondi's designs exemplify 1980s 'soft power dressing'. An American, Joe Eula began his career in the 1950s. 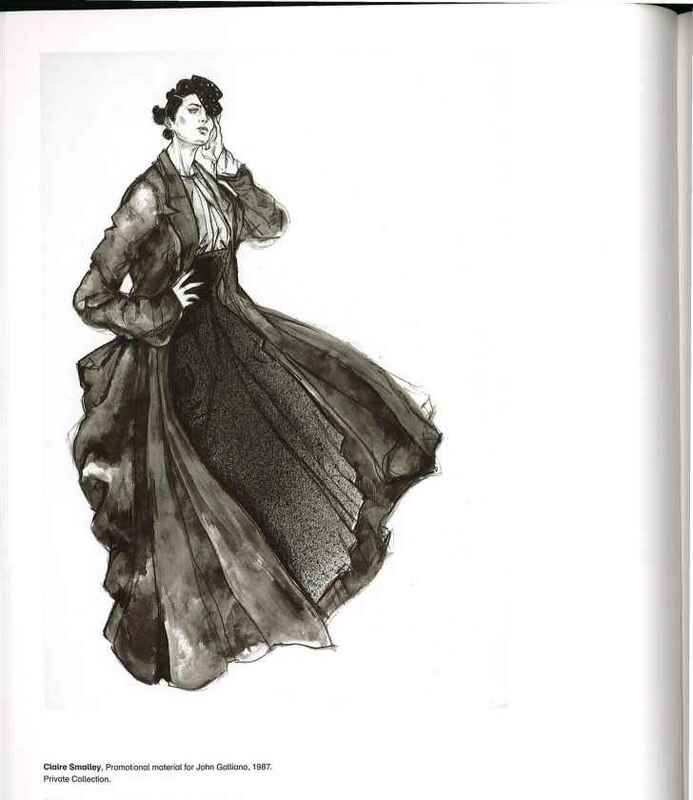 He illustrated for the Herald Tribune, Life, the Sunday Times, Vogue and Harper's Bazaar, as well as designing sets and costumes for the ballet and theatre. He also collaborated with Diana Vreeland on exhibitions at the Metropolitan Museum of Art, New York. Claire Smalley, Promotional material for John Galliano, 1987. Private Collection. 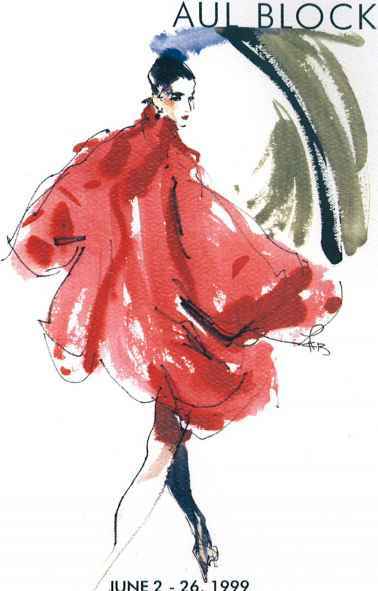 Claire Smalley, a graduate of Central Saint Martins, continued its ethos of drawing from life. 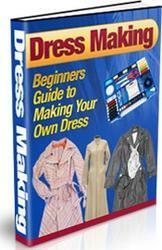 Her lyrical style gives the model equal importance to the garments and reflects her exacting preparation. 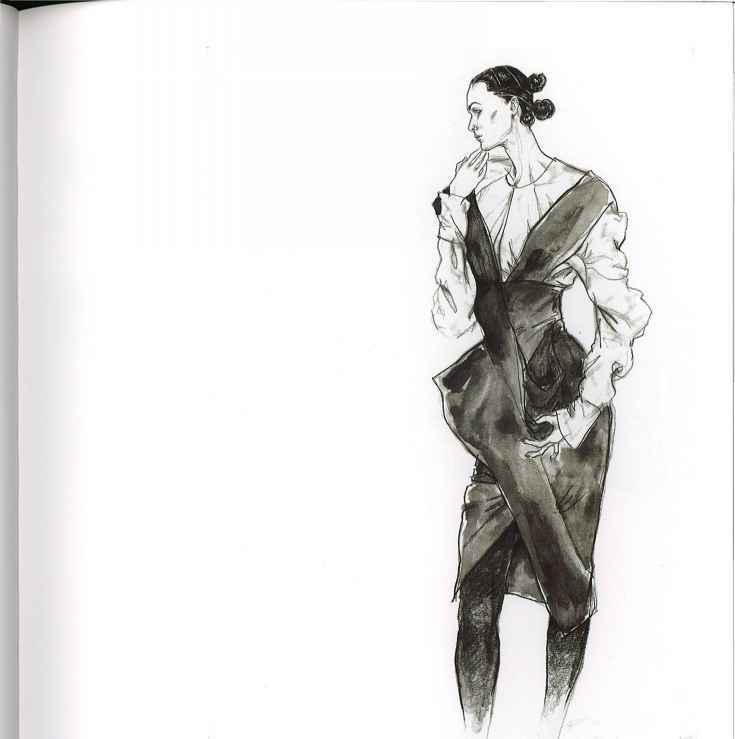 Smalley collaborated closely with Galliano and later worked for View, a forecasting magazine. In 1983 Galliano's graduation collection from Central Saint Martins, 'Les Incroyables', brought him critical acclaim, and in 1987 he won the first of four British Designer of the Year awards. He went on to head the house of Givenchy and, from 1996, has been chief designer at Dior. Galliano draws much of his inspiration from historical sources, but always produces clothes with a glamorous and contemporary edge. Smalley's graceful models capture the essence of his essentially romantic style. Smalley's ability to show different textures in her monochrome drawings provides detail of cut and construction without losing any of their supreme elegance. 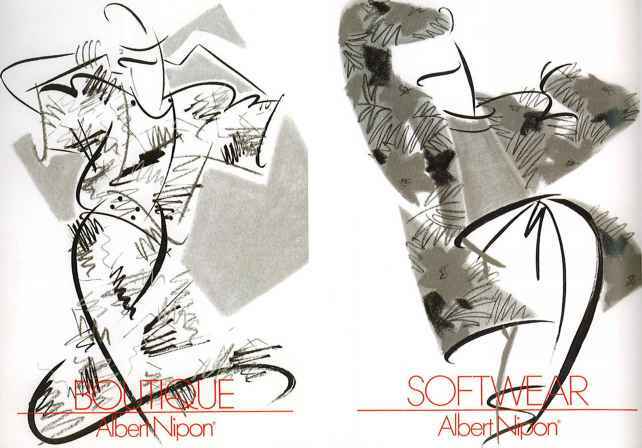 Ty Wilson, Promotional material for Albert Nipon, 1988. Artist's Collection. Ty Wilson began his career in New York in the early 1980s. 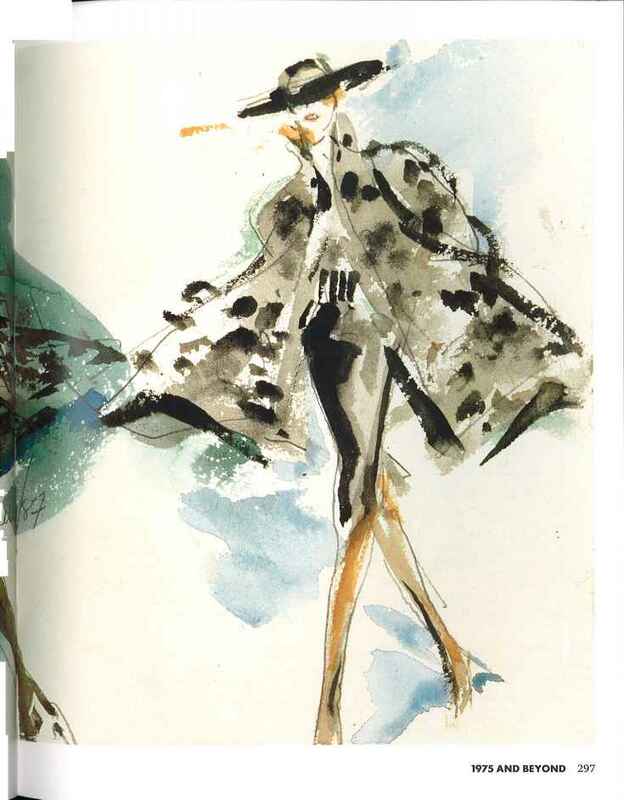 He has illustrated for many of the major fashion magazines, including Vogue, WWD, Harper's Bazaar and Vanity Fair, and has done advertising campaigns for Bloomingdale's and Macy's. Wilson's ability to convey a sense of movement enhances the simple shapes of the garments. Originally specializing in maternity wear, Albert Nipon was Philadelphia's most famous fashion label from the early 1970s. Ruben Toledo, 'Gossip in Ihe Dressing Room'. Original illustration for the New York Times, 1988. India ink on paper. Artist's Collection. 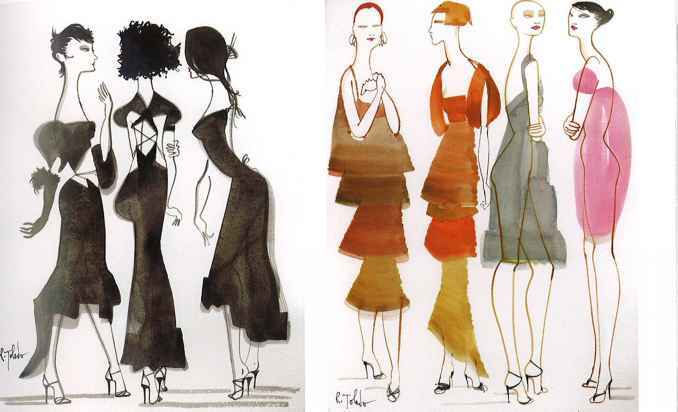 Cuban artist Ruben Toledo's muse is his fashion designer wife, Isabel, with whom he collaborates closely. Both humorous and informative, this advertisement announced the arrival of the Isabel Toledo lingerie and nightwear collection at Barneys, New York. Ruben Toledo, 'Ready to Wear Sleepwear'. Original illustration for Paper Magazine, 1989. Watercoiour on paper. Artist's Collection. 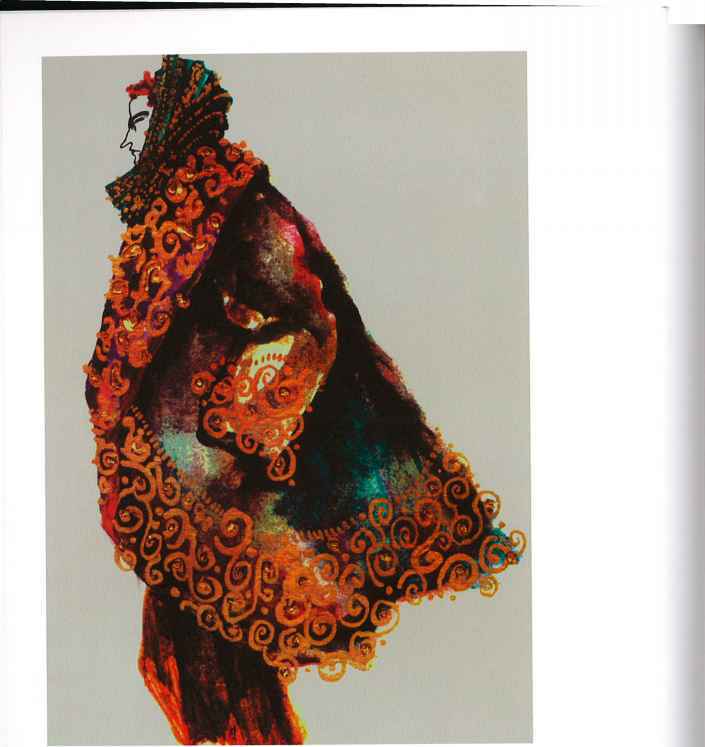 How to layer, reuse and recycle, by Isabel Toledo, for an article on multi-use garments. 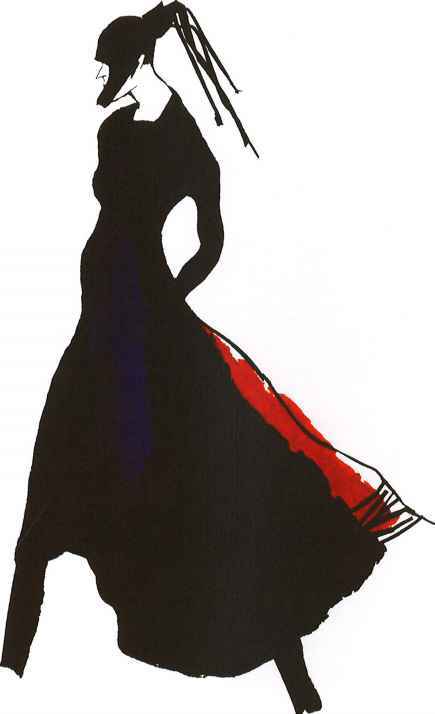 Ruben Alterio, Original illustration for Mirabella USA, c.1989. Crayon and oil on paper. Courtesy Galerie Bartsch & Chariau, Munich. Since the early 1980s the Argentine illustrator Ruben Alterio has contributed to numerous fashion magazines and has many corporate clients. 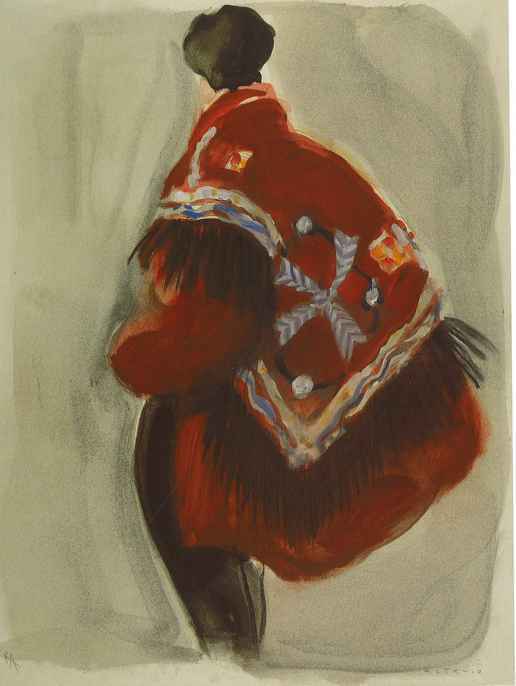 Ruben Alterio, Original illustration for cover of La Mode en peinture, 1989. Crayon and oil on paper. Courtesy Galerie Bartsch & Chariau, Munich. 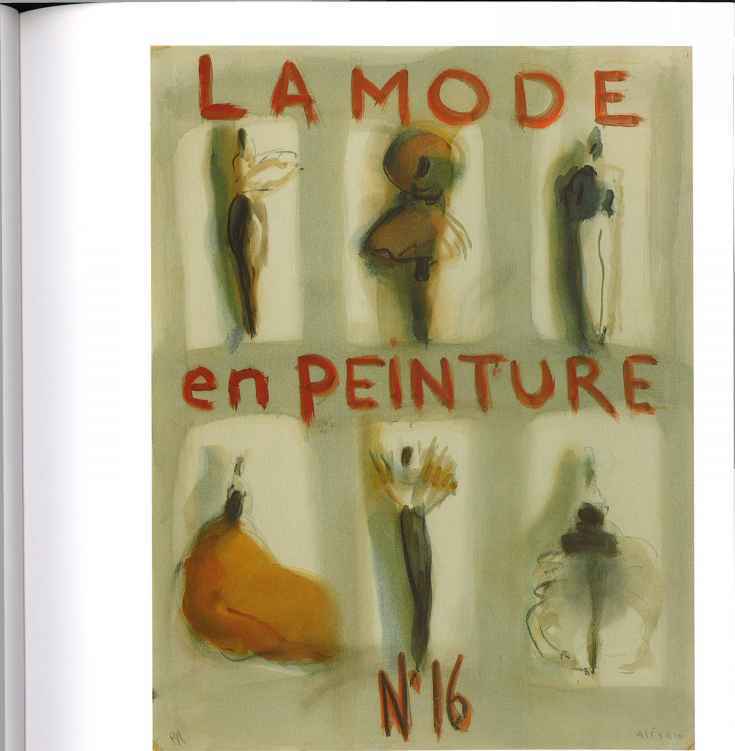 Published from 1982 for ten years, La Mode en peinture contributed to the revival in illustration during the period. ZOLTAN+, Romeo Gigli for Donna, 1993. Artist's Collection. Romeo Gigli showed his first collection in 1983, designing romantic clothes in rich colours and textures wrapped around the body with a soft silhouette. Zoltan, an Hungarian artist, also collaborated with Issey Miyake and illustrated numerous fashion magazines before moving on to photography and computer graphics. ZOLTAN+, Yohji Yamamoto for Femme, 1989. Artist's Collection. Yamamoto was at the forefront of the avant-garde Japanese designers who started to show in Paris in the 1980s. Their intellectual approach, embodied in layered, figure-concealing garments, was the antithesis to 1980s 'power dressing' and was to transform fashion during this period. Ty Wilson, Paul Costelloe, 1990. Artist's Collection. Irish-born designer Paul Costelloe established his own label in 1979. His trademarks are comfortable classics in natural fabrics - fluid linens, tweeds, cashmere and leather. 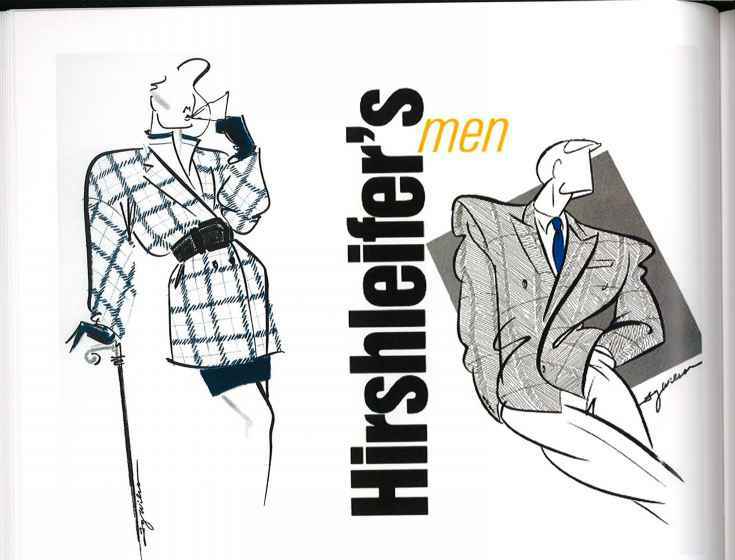 Ty Wilson, Promotional material for Hirshleifer's, 1990. Artist's Collection. Ty Wilson's swaggering style captures the soft, yet exaggerated silhouette of early 1990s menswear.